"70% of Time Could Be Used Better..."
"My goal was to capture the tools, tips and hacks they use to make every work hour count. Below, I share eight strategies that have worked for them and for me, so we can all stop wasting time and missing out on opportunities. Say 'no.' Try “No” templates — canned responses for all the common situations where you find yourself saying no. Be an email ninja. Most productive CEOs make a priority to get to inbox zero. Think about postal mail: Do you pick your letters up, look at each one, put them back down only to pick them up and put them down again and again? Manage your energy. Managing your energy isn’t just about physicality. It’s about understanding your mental rhythms too. Build playbooks. For anything you do more than three times, write down your process in detail. Build playbooks that you can hand off to someone else, so they can execute something exactly the way you would. Never get held up by people asking what the next step is or whom they should ask about a process. Get great at external meetings. To really get the most out of your meetings, you have to bridge personal and professional. It doesn’t have to be deep... Give yourself the opportunity to reach out again, outside of meetings, with a personal touch to build that connection and deepen it. Get great at internal meetings. 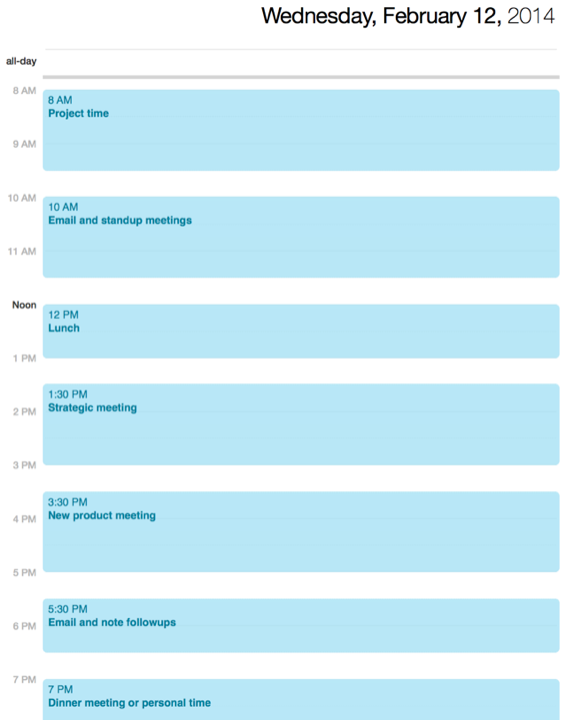 Startups tend to hold a lot of meetings. Too many. Have less. One of the easiest ones to kill is the status meeting. You don’t need to constantly meet with your team to provide a round robin of updates. Just have them write it down. Put it in a Google Doc and have everyone read it once a week. Give your team leverage. If you want them to model speed, you need to model speed yourself. Give them the help they need to do their best work in record time... Demonstrate the 80/20 rule in everything you do. This means spending 80% of your time on the work that moves the needle, and only 20% on the smaller stuff. Condition your team out of seeking perfection. So many startup employees, especially engineers, want to nail everything perfectly the first time. But that’s not what you want. You want speed. If you implement these simple hacks, you can get that 70% of time you aren't maximizing back. You can spend less time in meetings and your inbox. Most importantly, you can get back to leading, inspiring, closing deals and changing the world."